This model is based on sprites by GrafxKid--shout out to him for the great design to build off of. The .zip file includes the .blend with models and the setup used to make the preview. Textures are external .pngs. 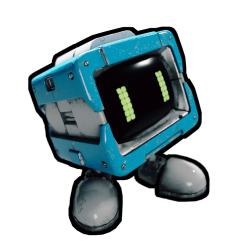 Made with Blender 2.79, GIMP, and xNormal. It's way off from perfect so may be updated in future. Set it free and have fun. Looks great in Eevee too, though the eyes don't show up. Whoa this is so flipping cool! 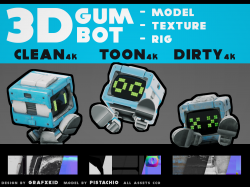 Gumbot in 3D! Excellent work!